Jenni is well-known in the cycling scene in London, having made her name through the London Bike Kitchen that she runs and it featured on BBC Radio 4's Women's Hour last year. In addition, she mans the desk at the WheelSuckers podcast along with Alex Davis. Oh, and she's the author of How to Build a Bike: Simple Guide to Making Your Own Ride. 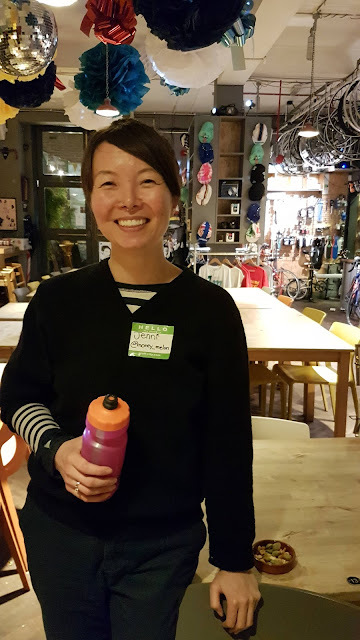 I have known of Jenni for a few years but funnily enough, it was only recently that I got to speak to her at length when I went to a women of colour cyclists' meet-up at Look Mum No Hands! So while there, I thought I'd find out a bit more about her. Jenni at Look Mum No Hands! I moved to Japan to teach English, and the school I was at gave me a bicycle as my transport – an old sit-up-and-beg bike - and I was like, "What is this? I haven’t ridden this since I was a kid." But then riding it became the smartest way to get around as I was in a small town in the countryside. Cycling turned a 20-minute walk into a 5-minute bike ride. It was fun, I was on my own schedule, and I was outside. It wasn’t until I moved to London 11 years ago, that I started to identify myself as a cyclist, because I feel like here you are definitely in a minority and you’ve got to stick together. You really, like stick up for other cyclists as well, and connect with other people who ride. When comparing cycling in the different places I've lived, San Diego is very similar to London in terms of volume of cars. I really like cycling on the continent, as I feel like drivers are way more respectful over there. In Japan people are very respectful. You don’t need infrastructure because the infrastructure is in their minds. Everyone is really respectful, and you can ride on the pavement and it’s fine because people just do that….and you can ride on the road and it’s totally fine because the cars are really polite and everyone is just aware – almost hyperaware. Whereas here it’s like you’re on your own. You’ve gotta fend for yourself. 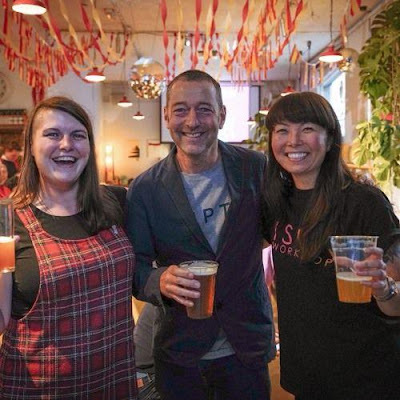 I’m the founder, director and benevolent dictator, and janitor at London Bike Kitchen. I set it up about seven and a half years ago and we opened a year later. I guess my reasons for starting it were personally selfish. I really wanted to learn how to build my own bike and there was no classroom space to learn how to do that. So I thought, I’m just going to set it up. I’m going to make it so I can learn how to build my own bike. Director, benevolent dictator and janitor outside LBK - Jenni does it all! I was pretty sure other people wanted to learn as well. But I also realised I love bike riding and when I used to send my bike off to the bike shop to get fixed I was not really sure what they were doing and I felt disempowered by that experience. So I thought to myself,"Well I can change a puncture, I can now change my brake pads, I feel good about being able to do that. What if I can do more? Surely that’s gonna make me feel better." That was an additional incentive to become a mechanic and set up this space where it’s all about education. I consider myself a mechanic now but there are different areas of expertise when it comes to bike mechanics. There’s definitely some things that I can’t do, like I can’t do hydraulic disc brakes. The ironic thing is we do a class on that, so I have to attend our own classes! But I can be great with quarter pins – like old bike stuff. So although I do consider myself to be a mechanic I am not some all-knowing all-seeing mechanic, though I know my way around a bike. 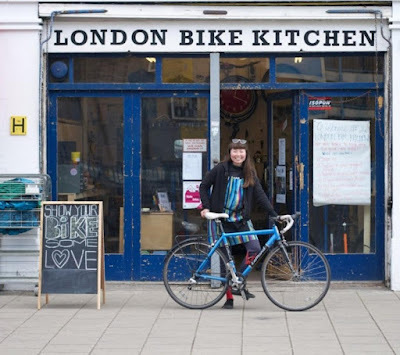 London Bike Kitchen is aimed for everybody, but right at the very start I knew I wanted to do a separate women’s night because I just don’t see other females working in the bike industry, especially not as mechanics and you don’t see a lot of women riding bikes. And I feel like they’re related. It wasn’t actually me who started the sessions for women, it was another person who had seen a blog post I wrote even before Bike Kitchen opened in 2011 and they contacted me and said they wanted to set up this women’s night, and they were gender variant and didn’t identify as being female, but they weren’t male either. So I told them they could take ownership of that project and decide how they wanted to present it. So they decided to call it Women And Gender-variant, kind of playing on the WAG acronym which is pretty derogatory I think, but I don’t know it because I’m American. But here, wives and girlfriends is not considered a good thing. So they helped create the space and we experimented with how often we should do it and how long it should be, what should we cover, what are the logistics of it. It took us probably about a year before we figured out the magic formula of twice a month - every second and fourth Monday from 6.30pm until 9pm. We have a set schedule that comes out every six months that lists everything that we are covering, so it gives people a sense of security when they come in – because it’s a really foreign environment. Going into a bike workshop is weird for most people – it’s going to be really weird for women, so we are trying to remove as many mental blocks – as many barriers as we can. The first year we opened we were getting like one, maybe two people coming, and it was really sad. But we kept pressing on, because we thought this is a good idea and we just have to find the right way to do it. Now we’re getting maybe 10 people coming to each session, so we're doing okay now. Our space is pretty small so it feels really crowded, but it works. Being featured on BBC Radio 4 Woman's Hour helped raise the profile. They got in touch with us because of our WAG nights. I don't listen to Woman's Hour so I wasn't really star struck. But it was great having all these different women in the cycling world come to the shop! With Alex Davis I form half of the Wheelsuckers podcast. I’m the stoker, Alex is the Captain. She steers the whole thing while I’m just the engine in the back. It’s really fun. It’s hard work but we form a good team. Neither of us would be able do it alone. I think Alex does have the hard work, with all the editing, but I think she likes it! We are always researching ideas for who to invite as guests on the Wheelsuckers Podcast, since we are both active on social media so we’re always kind of aware of what’s going on. The most interesting podcast we did was the one with Ninon Asuni. She's a very knowledgeable bike mechanic and one of my personal heroes. Currently we're hoping to interview Dr Rachel McKinnon, the first transgender woman to win a World Championship race. We hope to interview her next year. That will be an amazing opportunity. We also like to interview Ayesha McGowan [who is bidding to become the first African American female to race for a UCI road team] every time she comes into town. I remember seeing her when the BBC did a video on her and I was like…. "this woman’s amazing"….I need to follow her, and then suddenly a year later I’m interviewing her - WTF? 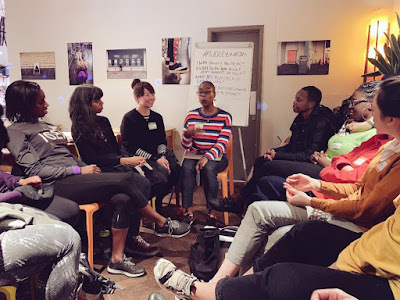 On the back of Ayesha talking about under-representation of women of colour in cycling Jools Walker and myself organised a women of colour get-together at Look Mum No Hands!. I thought it was great. Before our first meet-up me and Jools were so nervous. We didn’t know who would turn up or what we were going to be doing. We had no plan. We just wanted people to get together and talk. That’s all it was. 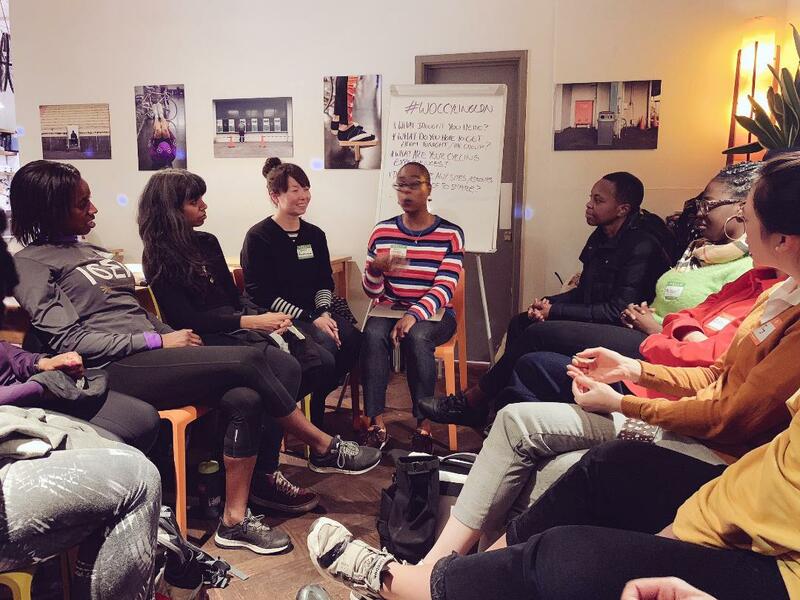 It's been so nice for people to come together and share their thoughts, ideas and hardships. you know we will definitely be meeting up again, and getting some rides out of it. It’s hard to say where my favourite location is to ride as there are so many great places. I did have a really amazing bike packing trip last summer. We were in the forests of Burgundy off-road for four days, and it was amazing just camping and cycling. You don’t go very far on a mountain bike but you don’t need to because everything around you is beautiful. Then we’d pop into the town and get some food, and we'd always get a bottle of wine. Whenever I go cycling, I never go out without my Happy Bottom Bum Butter chamois cream. It's great. I can't live without it! To anyone who wants to get into cycling I'd say get some cycle training. Four of us do free cycle training in the London area. If you are not based in London, your local authority may run cycle training sessions. Otherwise find a friend who rides a bike and just go out with them and make it fun. Always do baby steps. Don’t go out thinking you have to know everything at once; you’re always going be learning. Hashtag never not learning. That’s my saying. You will always be learning.